GLOUCESTER – It is the Dust Bowl in the midst of the Depression in the 1930’s, and both hope – and rain – are in short supply. 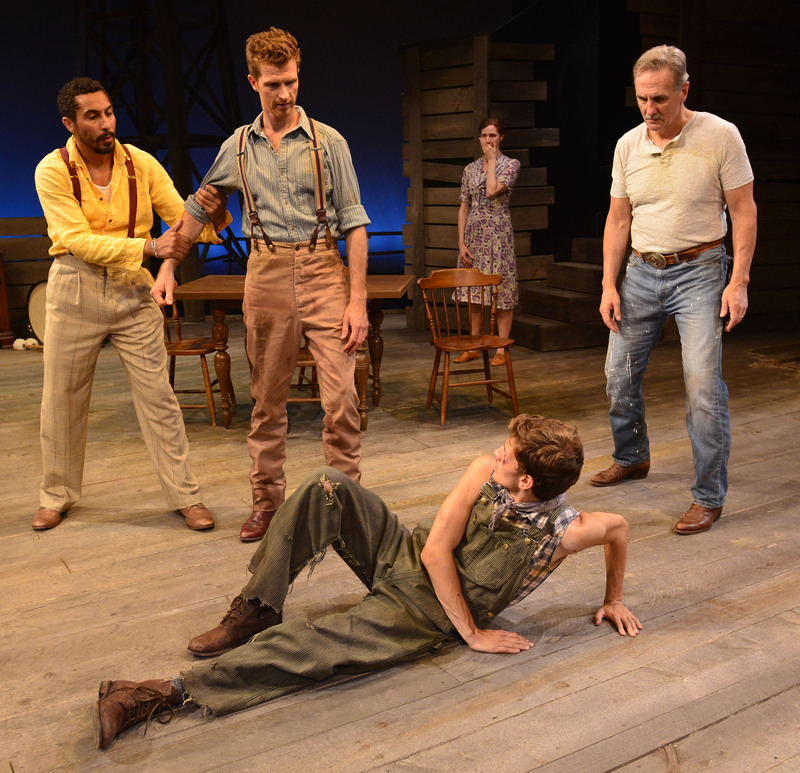 In the Gloucester Stage Company’s powerful production of M. Richard Nash’s “The Rainmaker,” that is particularly true for the Curry family on their Midwestern cattle ranch, where desperation and the seemingly endless drought go hand in hand, and livestock are dying. And while waiting for the rain that doesn’t show signs of falling, there is work to be done on the ranch, headed by patriarch widower HC Curry (David DeBeck), while dutiful son Noah (Joe Short) keeps the books and works the ranch with younger brother Jim (Sean McCoy), with the household run by sister Lizzie (Jessica Bates). Kudos to set designer Eric Levenson for effectively conveying the dusty, dry Curry ranch; you can almost feel the dust sticking in your throat as you watch the characters move about. Just that morning Noah has had to lay off two field hands, just after Lizzie has returned from her trip to Sweet River to visit Uncle Ned and his six sons, with the unstated objective obvious: To find someone who might be interested in marrying her. But Lizzie has returned with her tail between her legs, so discouraged she didn’t even go to the rodeo dance the last night she was away. She is a broken woman, but this will be a day to remember. Young Jim Curry is full of beans, chasing after a local hottie named Snookie with a red hat that has a very special meaning. But Noah has thrown up the stop sign, worrying his brother is involved with a woman eager to trap him into marriage. There are other broken folk besides Lizzie in town. File (Dave Rich), deputy to Sheriff Thomas (Norman Jones), has for years been portraying himself as a widower when everybody knows the truth: His wife ran off with another man. When the Curry men gang up on him with an invitation to dinner in a thinly-disguised attempt to portray him as a possible suitor for Lizzie, it doesn’t go well, and it appears another in an ever-decreasing number of doors has slammed shut. The mysterious stranger is a dramatic staple , and it doesn’t get much more mysterious than Starbuck (Brian Homer), who enters suddenly without invitation or even knocking, and starts selling hope the moment he opens his mouth. He is promising rain after asking $100 for his services. And he only asks the members of the Curry household to perform a few rituals that will speed the falling of the raindrops. Short’s Noah may be a loyal, dependable, hard-working son, but perhaps feels that in many ways life seems to have passed him by too, jealous that Jim or Lizzie or both may find someone and go off on their own, leaving him trapped on the ranch. The entire production hinges, more or less, on Bates as Lizzie, and the good news is she delivers on all counts. Hiding behind the facade others have designed and built for her, she nonetheless believes in the power of someone or something restoring hope where there was none. When she finally loosens her bun and lets down her hair, she is luminous, and the release is a symbol that Lizzy has nothing to lose and is ready to let herself go and embrace whatever life has in store for her, even if it is the rainmaker, whom she knows in her heart is a fake and a fraud. At least he has caused her to feel something and that just feeling something may be what unlocks her future. Director Robert Walsh, artistic director of GSC, is one of the finest directors in the Boston area and his casting – and the direction – just feels right from beginning to end. Russ Swift’s lighting skillfully evokes the unyielding noontime sun, late day shadows and sunset while Linda Ross’s costumes evoke the Depression-era drabness. David Reiffel’s sound design provides an effective sound track to the events. “The Rainmaker “ was a teleplay that came to Broadway in 1954 and remains a work of enduring worth and value. In this GSC production it serves as a showcase for the talents of Bates, Short and director Walsh, with strong support in the other roles. 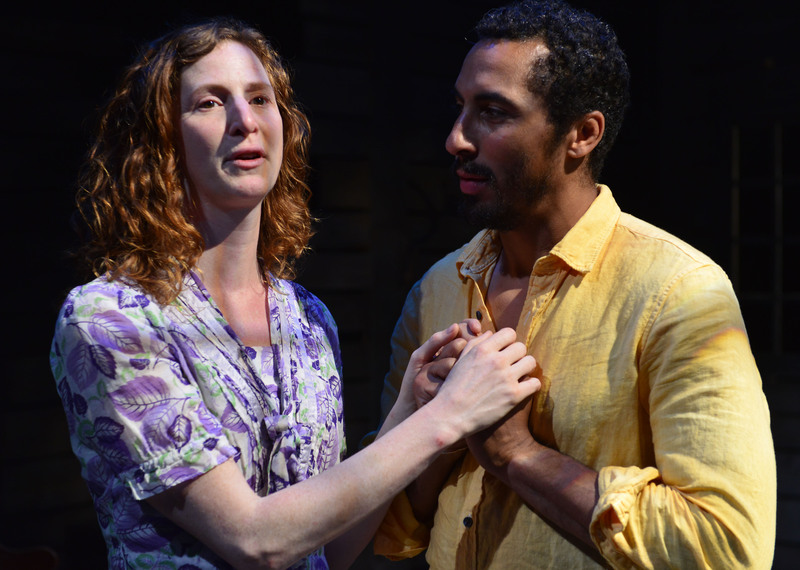 The Gloucester Stage Company production of “The Rainmaker.” Written by N. Richard Nash. Directed by Robert Walsh. Set design by Eric Levenson. Lighting design by Russ Swift. Costume design by Linda Ross. Sound design by David Reiffel. At the Gloucester Stage Company through Aug. 5. gloucesterstage.com.